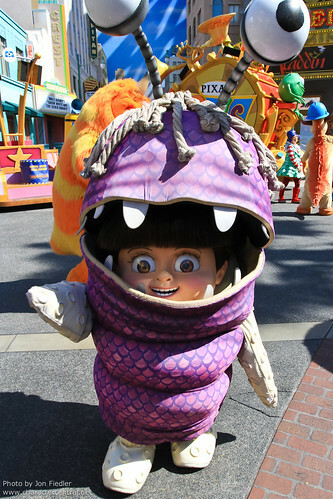 Boo is the little girl who gets lost in the Monster world by venturing through her closet door. Boo finds herself in a world where she is misunderstood and treated as though she is dangerous to public health! In the end, with the help of her friends Mike and Sulley, the Monster world realises that children bring them good, positive energy through their laughter. Boo is returned home, but the Monsters still like to visit... albeit, thanks to Boo, performing stand-up comedy! Boo cannot be met at the Disney Parks, but has appeared exceptionally at some special events.